training in industrial practice on site at the non-academic partner institutions which is expected to enhance their career perspectives. Small soot particles or particulate matter (PM) is one of the deadliest forms of air pollution: such particles, inhaled in traffic and city centres, are linked to a wide range of serious health effects, including premature death, heart attacks, and strokes, as well as acute bronchitis and aggravated asthma among children. Additionally, the presence of soot in the atmosphere has been associated to regional as well as global climate change. Despite the immense reduction in soot achieved from Diesel engines (~90% relative to 2000 levels), about 30wt% of soot and ~17% of man-made CO2 emissions is attributed to Diesels. CO2 and soot emissions, from heavy duty Diesel engines in particular, are expected to increase by 75% the next 2-3 decades and count more than 2/3rd of the total fuel usage due to the constantly increasing energy needs associated with the expansion of urbanisation, population growth, and the transportation needs in developing economies, that will be met by Diesel engines. 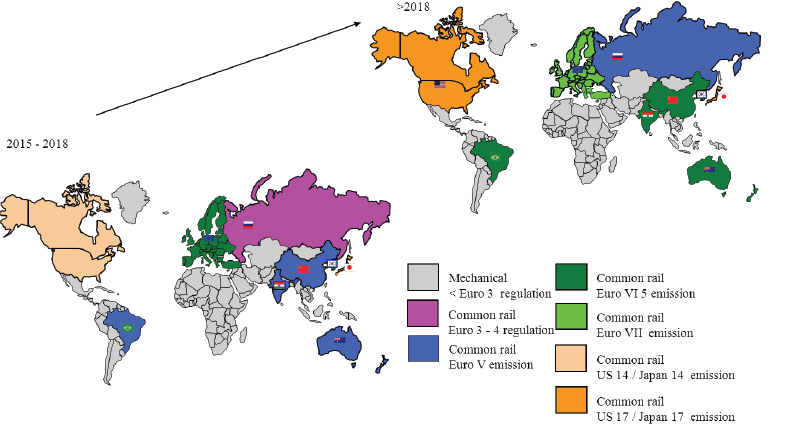 To mitigate this, increasingly stricter emission legislations (illustrated in the map below, for 2015 and expected for 2020, for various types of Diesel vehicles) are gradually established worldwide. Different technologies are implemented to confront effectively the emissions from Diesel engines. Copyright © 2019 IPPAD ITN Project All Rights Reserved.